Brondow, Inc., Is Celebrating Their 75th Anniversary! For an effective and reliable household cleaner, try Brondow's Breath O' Pine, available at retail locations throughout the Northeast and parts of the Mid-Atlantic. For more than seven decades, our products have kept homes across the U.S. clean and fresh. We also have new products and scents available for you and your family to enjoy. Reach out to us by phone to order your favorite Brondow household cleaners. Baby Fresh - An Industry First! Breath O' Pine has been a favorite in many homes for generations. 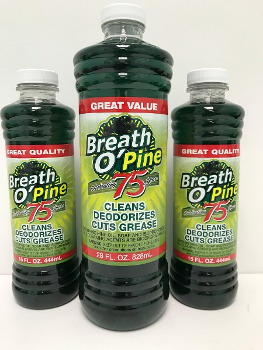 As a premium Pine Oil cleaner, Breath O' Pine contains more Pine Oil than any national brand. You will see the difference and enjoy the long lasting smell of clean. Great for even the toughest jobs like toilets and garbage cans. Pine oil has great Natural properties. As a natural defense for trees it can help repel bugs and even kill some germs. It also is a great cleaner and leaves a long lasting clean smell. These great economical cleaners offer a great value in 5 different scents. You have a choice of Pine, Lemon, Lavender, Orange, or Potpourri. Help to make your home be Clean & Fresh all the time while saving money. A great option of those tough cleaning jobs. 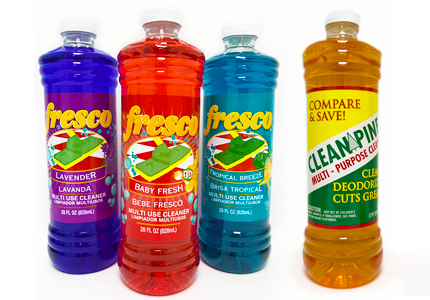 With extra cleaning power Fresco can help with the heavy duty jobs. Available in 3 great scents - Baby Fresh, Lavender, and Tropical Breeze.